The Third Annual BAUUC Community Garden Potluck was held on Saturday, August 18th. Twenty-four gardeners and guests from BAUUC and Bronson Street Community Gardens attended. Nancy Saint, President of the Clear Lake Chapter of the Native Plant Society of Texas, shared her expertise on the importance of native plants and their use in area landscaping. We enjoyed a veritable feast including several delicious salads, pickled okra, penne pasta with pesto and bruschetta with tomatoes. Most of the dishes featured vegetables grown in our gardens. We finished the meal with several desserts and Siok Hong Chen-Sabot’s creative “vegetable” cake again this year! Everyone went home with a door prize, including our church honey and Siok Hong’s salsa made from Bruce Meltzer’s tomatoes. The Share Table offered seeds, plants and worms. It was a successful and enjoyable potluck and we look forward to our fourth one next year. A special thanks to Patrick Ferrell and Paul Dum for mowing our garden. It looks great! Our next workday will be on September 15 from 8:30 ‘til 11. Come and join us. Sharon Juntunen of Bronson St. Community Garden donated a mason bee hotel for the Share Table. Mason bees are native bees that pollinate many fruits and vegetables. Siok Hong donated her homemade salsa to the Door Prize Table. The native ground-cover, Frog Fruit, can be found near the tractor shed. Keep it moist. BAUUC Community Garden News: Jane and David have converted their raised beds from decaying wooden sides to concrete blocks. No more rotted boards or ants! They ordered more soil on the November 18 workday to fill their larger beds. A donation bed was tilled and two varieties of lettuce and broccoli were planted by Siok Hong, George, Jill and Nathan. The battle with the deep grass roots was finally won! George’s zinnias and Siok Hong’s butterfly weed are attracting several kinds of butterflies and other insects. Be sure to walk through the garden after church on the next sunny day. Siok Hong is also harvesting sweet potatoes that Urban Harvest shared with us early last spring. Wow! Next garden work day is Saturday, December 16th from 9am – 11:00am. Join us for a cup of cocoa! The Second Annual BAUUC Community Garden Potluck was held on Saturday, August 19th. Nineteen gardeners and guests from BAUUC and Bronson Street Community Gardens attended. It was a pleasure and honor to welcome and meet Julie Lambert, our former Director of Lifespan Religious Education and the founder of our community garden! Thank you, Verva and Mike, for inviting Julie today. Terry Garner of Urban Harvest shared his expertise in a lively presentation on the essentials of successful gardening. Dawn Newcomer, Urban Harvest Community Gardens Coordinator, also attended our potluck and asked if we’re interested in being a “hub” community garden. Among other activities, we would distribute fall and spring vegetable seedlings to area gardens. We enjoyed several interesting salads, home canned vegetables, tempura fried okra, homemade Meyer lemonade and Matcha green iced tea. We finished the meal with Siok Hong Chen-Sabot’s “vegetable” cake! Everyone went home with a door prize. Jane Malin won the best prize – a rain barrel system donated by Urban Harvest. A big thank you to Bruce Meltzer and Paula Criswell for their special door prizes. It was a successful and enjoyable potluck and we look forward to our third one next year. Garden Potluck – Great Success! On August 20, eighteen gardeners attended the 1st BAUUC Garden Potluck held in Cockrell Hall. We had a delicious lunch including fresh salads, soups, casseroles, pasta salad, homemade cookies & cakes. With such a great turnout, we hope to make this an annual event! Those attending were: George Becker, Ellie Childs, Cindy Lewis, David and Jane Malin, Deandra Newcomb, Ana Payne, John Regner, Siok Hong Chen and David Sabot, Emily Savino & Scott Pensyl, Rosemary S. Clist, Nathan and Jill Veatch. Attending from Challenger 7 Community Garden: Oscar and Sandy Nelson, and Japheth Olivier. Everyone shared their gardening experiences with each other and helped to build a Bay Area community garden fellowship. We also had the pleasure of winning several door prizes including fresh honey and gardening books. A huge thank you for those that attended. We look forward to hosting another Bay Area potluck! BAUU Community Garden in the News! Our very own Community Garden was mentioned in an article about Bay Area Gardens in the Houston Chronicle. Check out the Article here! If you got inspired by the article, please join us for the our next garden work day on Saturday, June 11th from 8am – 10:30am. Bring water, wear a hat & gloves if you’ve got them! On Saturday, 1/16/2016, the UU Youth from Texas, Oklahoma, and Louisiana braved chilly weather to hoe, dig, rake, and as one youth said “make the green disappear!” In two short hours the congenial group of about 80 youth and adults were able to prepare three 20ft beds and three 10ft beds for planting our spring gardens. We will be planting onions, carrots and lettuces that will be donated to our church kitchen and area food banks. (We used the planting directions from “Bulb Onions a Plenty,” by Bruce on May 22, 2015.) Thanks to Wally, Nelda, Verva, and Ivar, we had enough tools to accomplish the job. By 12:30, everyone had left except George who worked in the rain to fix a broken water line. Thank you, George! The replacement of the rotted sideboards is well on its way with Bruce M. and Kate’s three beds being completed by a contractor. George and Nathan have lined two of the 20ft beds and will be working on the rest on Wednesdays and Fridays. If you can help with this job, please email Nathan. We would appreciate your help, whether you have a bed or not! The next workday is scheduled for February 13 and the second Saturdays of the following months. If you would like a bed and/or have questions, email Nathan at nveatch@swbell.net. Thanks for visiting us at bauucgarden.org! We have a great many pictures to share of today’s work day! Posts & Photos by Nathan. 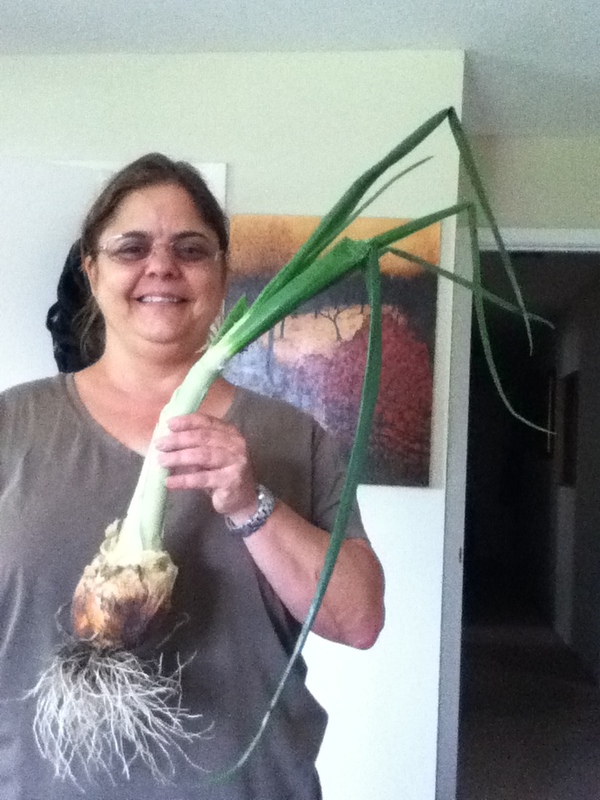 Carol Anderson and her crew just harvested this huge onion – over 40″ long from root to tip! Imagine that it started the size of a pencil in a set from Wabash Antiques and Feed last fall.